Your Humber World: Being Buried in the Snow! Being Buried in the Snow! 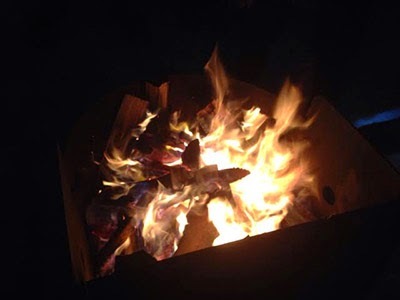 Camping is an experience that everyone should have at least once in their life. I have never personally been camping back home. I have been to desert safari and things like that (which was pretty epic btw), but I have never had the chance to build a fortress with snow or sit by warm fires and tell ghost stories. It was always fascinating to see things like that in movies and I would have never thought of doing so myself mostly because of the climatic restrictions to such activities. Here, however, things are very different. It is strange how going to Humber College and living in Canada has changed my perspective on life and how I live it. For instance, I never travelled in buses or trains back home because there was always someone who could drive me or I would drive myself. I had never worried about my rent or paying my tuition on time or even getting enough groceries for the week. Ever since coming here I have found myself being more adult, more careful and more efficient. However, things are not so serious and boring all the time. Since I am becoming more mature in my day to day life, I also have more flexibility and opportunity to have fun. 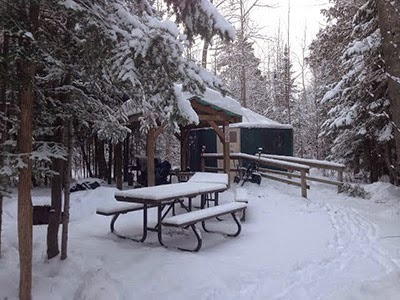 This brings me to the original topic that I wanted to talk about, the winter camping trip that I recently went to with Humber. Suffice to say – It was cold (well what else should I have expected?). I wanted to talk about..."
We went to Mcgregor Point Provincial Park and stayed there for a couple of days. There were around 20 people on this trip including one of our Student Advisors – Matthew Keefe. The first day, as soon as we arrived, we unpacked and got ready for a hiking experience. 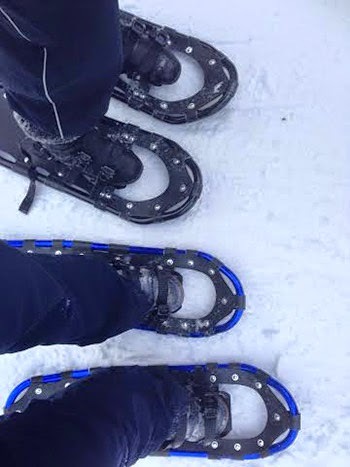 The guides gave us these weird looking strap–on shoes which were supposed to help us with walk on deep snow. So we strapped them on and started the day with a long hike. While walking like penguins (because of the shoes), we had conversations about birds and nature and trees and the beautiful outdoors in general. Some of us decided that it would be a good idea to race in these shoes. Keep in mind, dear readers, that most people in the group were in their 20’s – considerably younger than our guides and Matthew. 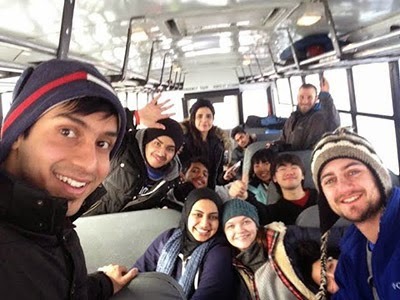 So when we raced in the deep snow, pushing and falling while we were at it, most of us were out of breath before we even reached the finishing point. Not Matthew though. He not only managed to finish the race but was also the first one to do so. He then went on to making fun of us ‘young people’ who couldn’t beat him. That was embarrassing! I was probably one of the last people who ended up panting and heaving while just barely making it. Trust me, it is not easy walking on the snow, let alone running on it. After this embarrassing ordeal, we played the game called “Capture the flag”. This is where two different teams attempt to steal each other’s flag and bring it to their home base without getting caught by the other. Our team won the first two rounds of the game because we had the Mighty Matt on our side. It was an extremely fun way to stay warm because we were either running or we were anticipating the enemy to infiltrate our home base to grab the flag. I remember tackling one of the girls and throwing her in a large pile of snow because she was about to catch one of my team mates who was holding her team’s flag! It was so much fun! The best part was that after all the tackling and cheating and snow force-feeding, all of us came out laughing and pumped with adrenaline…. And hungry! We came back to the camp and got ready for dinner. I saw one of the guides chopping wood and I just wanted to give it a try. He helped me understand the need to have the proper stance in order to chop wood and not your feet. It was pretty cool, although knowing my temperament my friends asked the guides to keep the axes away from my sight. Teehee like I wouldn’t kill them if I didn’t have an axe with me. "we came back to the camp..."
Anyway, so after my many failed attempts at chopping wood, we finally had a few pieces to start the fire. It got dark and we were given head torches in order to find our way around. ",,,we finally had a few pieces to start the fire..."
The next day we set off to make a Quincy – basically an Igloo except we don’t use ice bricks but compact snow. So the way it goes is that we had to gather A LOT of snow in one area and then compact it together then add more snow. 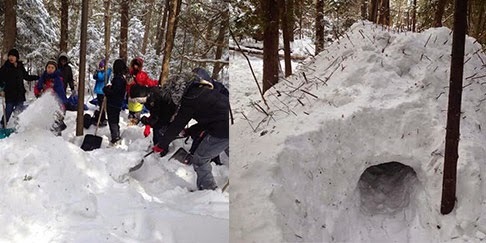 When the snow was piled up, we would dig a tunnel through it and get enough space in the centre of the pile to make room for people to sleep. So we worked on it all night, well some of us anyway. Rest of us gathered near the fire to defrost ourselves while the food was warmed up on the stove. 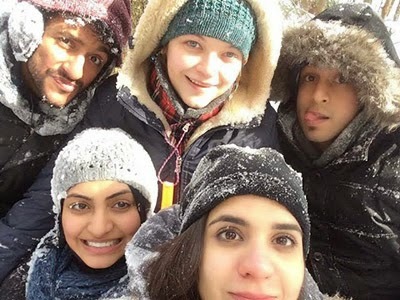 Since the group was made up of different people from different geographical, cultural and academic backgrounds, we introduced ourselves and got to know each other better. "...we set off to make a Quincy..."
I don’t know if I mentioned this before, but I have always loved new cultures and things that operate in a different way than I know them to. It fascinates me to understand that one thing can have entirely different meanings in two different cultures. This was a great opportunity for me to meet with such people. I met with a student from China who could write in amazing Calligraphy. I met with a student who was multi-lingual and could write and speak around four languages. I met with adventurous people, I met with smart people, I met with daring people. It was a pretty unexpected combination of individuals who came together because of this trip and made this experience even more enticing. So, what is the gist of this blog? My experience taught me that even if you don’t like the cold, you should still go on this trip. 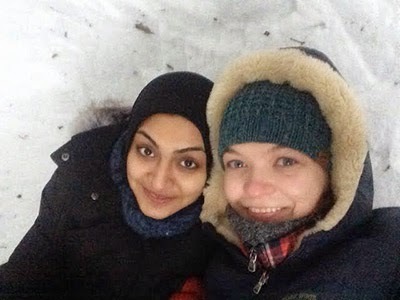 Not because we got to build a snow fort or because we had amazing people with us, but because of the quiet outdoors, because of the beautiful stars you get to gaze at…. And also because burying your friends in snow is pretty sweet!